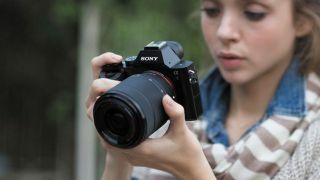 Sony started its full-frame mirrorless range relatively early, which has helped it to gain a strong footing in the market. And lucky for us, that’s also given us a good handful of opportunities to pick up an older model on the cheap as Sony likes to keep these older models in its range. The A7, the original full-frame mirrorless camera that arrived long before Canon and Nikon’s joined in with the fun, is now back to it ultra-low Black Friday price in time for Christmas. While the original RRP of £1,549 is a little misleading as we haven't seen it at that kind of price for a year or so, the latest price of £659 with a 28-70mm f/3.5-5.6 FE OSS kit lens is the best price we've seen for this bargain full-frame mirrorless camera. It gets better though as Sony is alos offering £150 cashback on this kit right now, which, subject to a successful claim, would bring its final price down to a remarkable £509. While admittedly outgun by its newer A7 II and A7 III siblings in a few areas, the A7 is still a very well specified camera. The 24.3MP sensor resolution, for example, is still on the same level as many full-frame cameras released today, balancing decent resolution with modest file sizes, and as it doesn’t have an optical low-pass filter you get all the goodness from whatever lenses you use. On that subject, the lens mount is the same as those on newer Sony models, which means that you can use precisely the same optics, from the company’s ZEISS-branded options through to lustworthy Art-series optics that Sigma has recently made available for the series. Its 3-inch LCD screen has a respectable 1.23-million dot resolution and it tilts to let you shoot from awkward angles, while the electronic viewfinder allows you to see what you’re doing in a range of lighting conditions where an optical viewfinder may not. Full HD video up to 60fps and Wi-Fi with NFC round off the spec sheet nicely, and all of this is wrapped up in a rugged magnesium alloy body, which is miles ahead of the polycarbonate casings that pretty much any other camera at this level offers.